The patent cliff has been a hard-to-miss event in the pharma industry: not only has it been extensively covered in pharma news and blogs, its notoriety frequently extends into mainstream media in the context of global pharma pricing pressures and Obamacare. The immediate effects of the cliff are well understood: between 2009 and 2015, the innovative pharma industry is facing the sharpest and most abrupt revenue decline in history. Of the 20 historically best-selling drugs, 18 will lose patent protection. The total annual losses inflicted on the industry by patent expiry during the 2009-2015 patent cliff period will amount to ~US$ 170 billion - a figure which is already rocking the pharma world. Pfizer’s Lipitor and Viagra, Eli Lilly’s Zyprexa and Sanofi-Aventis’s Plavix, will face patent expiry and inevitable engulfment by the generics industry, which stands to gain lavishly from this tremendous event. Amidst aggressive cost-cutting strategies on the part of Big Pharma, and alongside increased competition and consolidation in the generics sector, the effects of this colossal event rocking the world’s second largest industry reach further than what meets the eye. One of the natural seismic shifts induced by the cliff is steadily sailing the industry towards unfathomed shores—namely, the much-hyped-about “Pharmerging markets”. 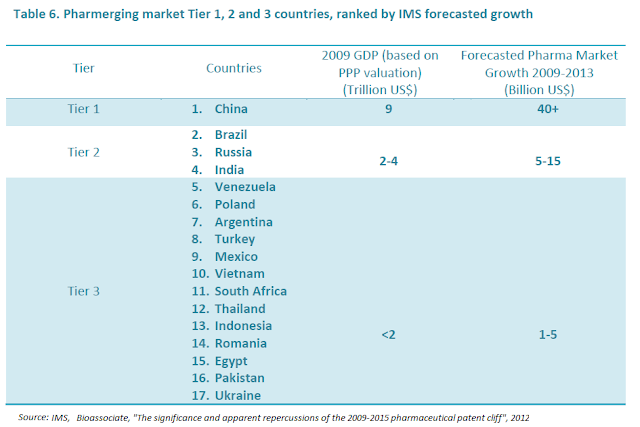 India, China, Russia and Brazil are some of the more obvious novel destinations for large pharma to nest in—but the likes of Ukraine, Romania and Egypt are there too. 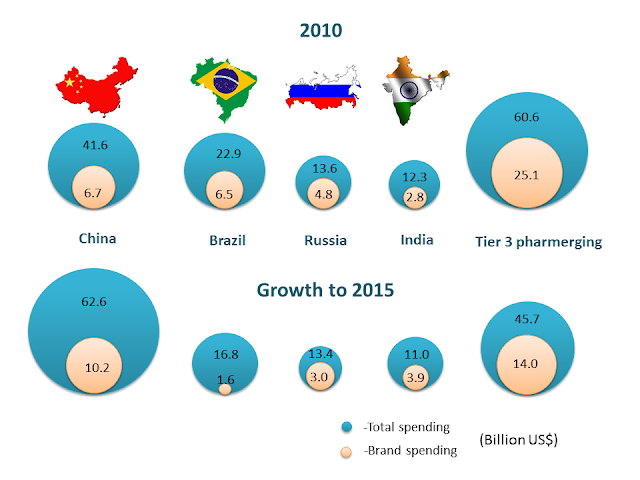 The projected growth of “pharmergers” is undeniably seductive for pharma: the spending on branded medications in China is expected to double by 2015, and to grow nearly six-fold since 2010 for generics. Other markets are steadily following suit. Domestic markets are not likely to provide for the demand, at least not in the innovative sector: currently only 15% of the domestic pharma market in China is captured by patented products. Despite the heavy focus of the next set of 5-year plans on inducing innovation, the unpronounced local interest in originator medication is not likely to skyrocket in the immediate future, and multinational pharma have taken notice of this. So how is the industry whose R&D and production facilities are still largely based in Europe and North America going to cope with accommodating such unprecedented, and geographically inconvenient, demand? As one of the first proactive partakers in the Pharmerging phenomenon, Roche has pledged to spend over US$ 310 million in China in order to take it up three spaces up to its second largest market. Roche will be opening offices across nine cities and heavily investing into “Personnel development, recruitment, instruments and systems”, according to Daniel O’day—Roche Diagnostics’ COO. Similarly, in 2010, Novo Nordisk had pledged US$ 100 million to expand its R&D centre in Beijing, and GSK announced that it will be moving its anti-bacterial facility to Shanghai. With a wave of new entrants in emerging markets, and increased cost-cutting through offshore manufacturing, drug safety will inevitably become a concern for the public. According to a 2010 survey by Pew Prescription Project, Americans already hold very low esteem in foreign-made pharmaceuticals, and perhaps rightfully so. Manufacturing issues have shaken the pharma world on several occasions: in 2009, at the very onset of the patent cliff, the number of FDA recalls shot up by a staggering 309%, for the most part due to faulty packaging and labelling, as well as contamination. Generally, generic medicines are the culprits of recalls, though Pfizer, Novartis and Bristol-Myers Squibb have all issued drug recalls in the past year, in addition to common global GMP violators, such as Aurobindo and Ranbaxy, against whom a consent decree of permanent injunction was recently filed by the US Department of Justice. Inductively speaking, unless pharmerging governments are able to categorically instil the importance of GMP in domestic pharma sectors, the industry is in for a rocky road ahead. Governments of emerging economies must prepare for the new high-volume drug era: healthcare efforts must focus on drug safety as well as availability, and appropriate penal codes must be put in place for repeated violators. WHO is putting forth pharmacovigilance guidelines which will accommodate offshore manufacturing for developing countries, food and medical safety are high priority on the next G20 agenda, and local governments are generally expected to increase focus on novel healthcare regulations in the near future. It seems that the parallel shifts created by the patent cliff are travelling at velocities with a potentially dangerous mismatch, and public awareness is perhaps the first step to ensuring that governments and Big Pharma put enough focus on ensuring safety first and foremost. 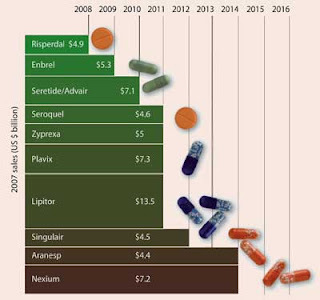 To read more in detail about these, and many other cliff-related developments, check out Bioassociate’s latest report: “The significance and apparent repercussions of the 2009-2015pharmaceutical patent cliff”.